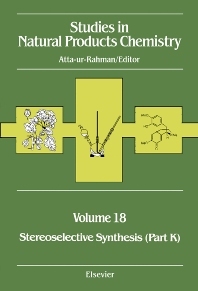 In Volume 18 of this well-established series, Professor Atta-ur-Rahman again brings together the work of several of the world's leading authorities in organic chemistry. Their contributions demonstrate the rapid, ongoing development of this field by illustrating many of the latest advances in synthetic methods, total synthesis, structure determination, biosynthetic pathways, and biological activity. The opening chapter presents an overview of strategies for the synthesis of several classes of natural products with an emphasis on complex polycyclic systems. Subsequent chapters discuss the synthesis of specific classes of compounds, including morphine, polyketides, acetogenins, nonactic acid derivatives, complex spirocyclic ethers, ä-lactam and pyridone derivatives, inositol phosphates, sphingolipids, brassinosteroids, Hernandia lignans, and dimeric steroidal pyrazine alkaloids. Finally, the ever stronger links between chemistry and biology are reinforced by chapters on the origin and function of secondary metabolites, bioactive conformations of gastrin hormones, and immunochemistry.